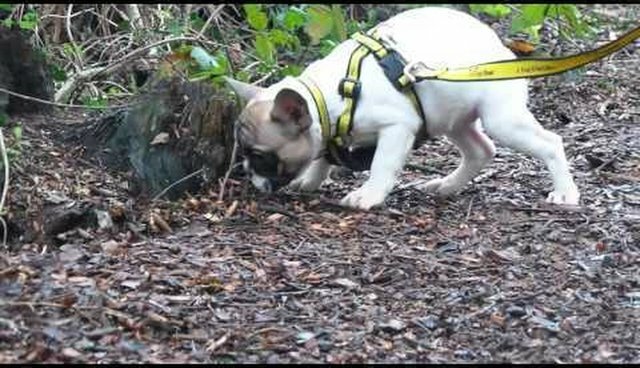 Dogs Trust, the UK's largest dog welfare charity, has captured the heart-warming moment when puppies who have been restricted to life in a puppy farm, the back of a van and the bars of a quarantine kennel, see the great outdoors for the very first time. As part of Dogs Trust ongoing investigation into puppy smuggling, the charity has made a landmark step forward by pledging to provide care and support for illegally smuggled puppies through their time in quarantine. These first puppy steps mark the end of their four month ordeal; the French bulldogs, English bulldogs, and Pugs were bred in Eastern Europe and illegally transported hundreds of miles before being intercepted in Kent and taken into quarantine in December. The puppies were bred and destined to be sold online but are now being cared for at a Dogs Trust rehoming centre and are finally experiencing life as puppies should. They are feeling grass under their paws for the first time, running through mud and playing with other dogs, all key parts of their social development. These puppies are now free and are finally experiencing life to the full. They have missed out on so many key socialisation elements in their young lives, and are now making up for lost time." Until Dogs Trust stepped in, seized puppies were at risk of being put to sleep or turned away at the borders, which meant another journey of hundreds of miles without food or water. The charity never puts a healthy dog to sleep, so for these casualties their future is secured. The puppy smuggling scandal cannot be left to animal charities to fight alone and Dogs Trust is calling on the Government to lead on a joined up approach. The puppies are now being cared for at Dogs Trust and will be up for rehoming in the coming weeks.